How do you test the waters for a frustrating game that uses hit music by a German Eurodance group called Snap! for its title, theme and soundtrack such as The Power? Isn’t it obvious? You first create a equally frustrating game based on one of their lesser known hits. This ladies and gentlemen is Ooops Up! (and that is the correct number of Os) and if you have played Pang you pretty much know what to expect. Ooops Up! was released in 1990, written by Sillicon Warriors and released by Demonware. 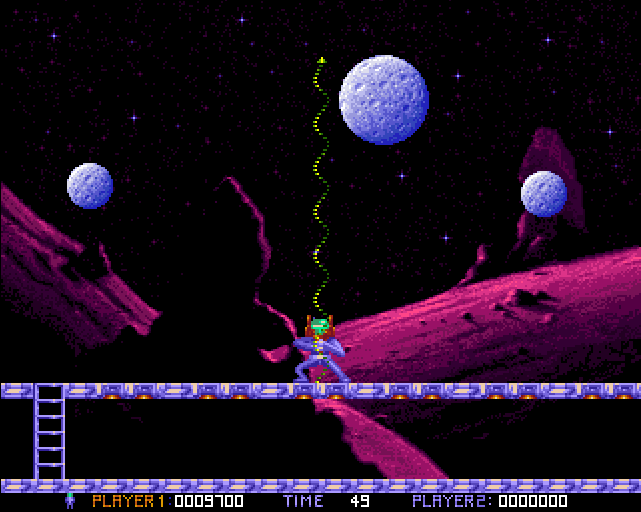 The Power followed a year later and the two games appear to share a musician (Peter Thierolf) and a graphics artist (Boris Kunkel). Our space hero wears a purple space suit with a green helmet and at all times he clutches his current weapon directly in front of him as he stares out at you awaiting guidance. He has a problem; he used to have this really snazzy space ship. Huge, fully armed, also sort of purple and prone to breaking apart into 100 pieces. Wouldn’t you know it, that is what has happened here. Maybe this is the Ooops Up! the games title refers to. Time to go collecting! 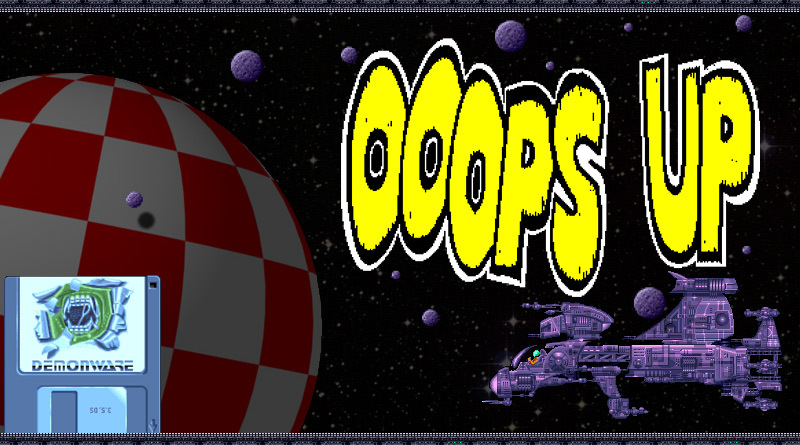 In order to piece your ship back together you will have to clear each area of a number of pesky bouncing meteors. When hit, like all meteors, they split into 2 smaller chunks and so on until you have reduced them to nothing. Meteors don’t always start out huge, sometimes you will start with a screen full of the smaller sizes. Your default gun fires a trailing beam upwards. When the beam hits the top of the screen or a platform it vanishes. Up until that point, if a Meteor hits any part of the beam it counts as a hit. When surrounded by multiple meteors you should spam the fire button, this can help you in a tight spot. Change to a dual pistol which allows you to shoot multiple twin shots and you’ll need to be very accurate or lucky to intercept a meteor. 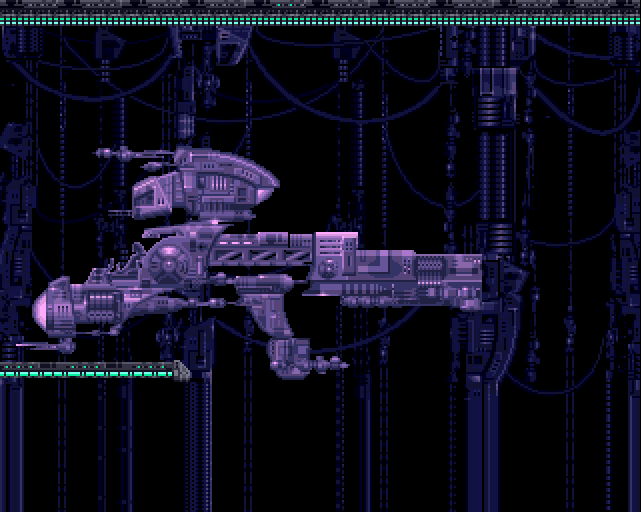 The last weapon fires cords which stick to the top of the screen or any platforms it touches. The cord remains in place for a few seconds before fading out. Alternative weapons are acquired by picking up the icons dropped by destroyed meteors. In addition you can also pick up icons that slow your enemies or freeze them for a short time. There are extra lives, shields, blobs of green glue that anchor you to the spot, icons that affect your controls and instant death skulls. 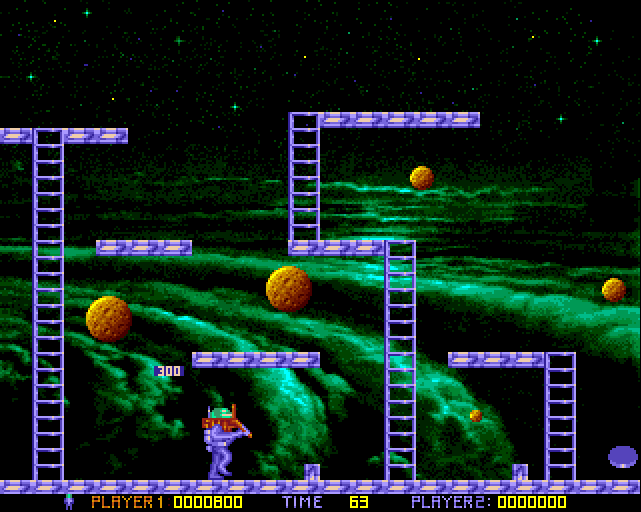 Each level also has a coin item to collect. At first these icon drops seem random but I cannot help but think that certain levels have specific items coded to drop in a set order, more on this later. Ground and air based alien life forms will attack from time to time. One hit with any of the weapons will dispatch the airborne type but the dual shot is useless for the ground based types as you need the alien to move into the beam or cord. 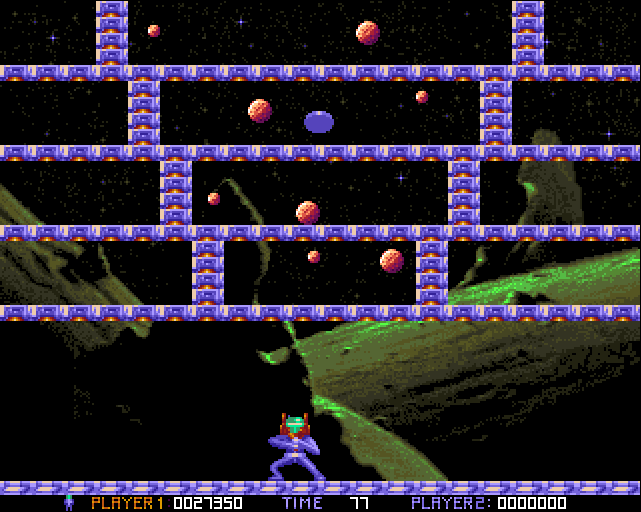 Some levels require you to destroy blocks such as those shown above. A single hit and the contained space rocks have an escape route. It is worth remembering that as you release those trapped in the lower levers that your subsequent shots could inadvertently release more from above so keep your eyes open. Thank goodness for the level code system because Ooops Up! is a highly frustrating game. Its premise is simple but at times it throws so much at you that progress can seem more like luck than skill. 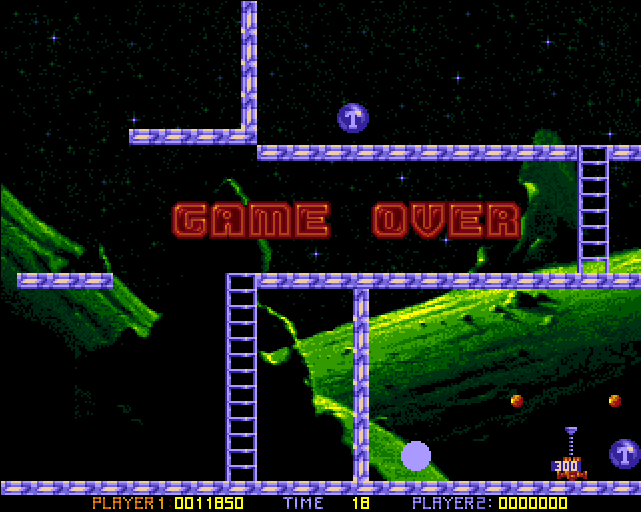 The first level is easy enough but the difficulty ramps up quickly. The frustration is with yourself for getting into a no win situation. I can’t work out how meticulously the levels were designed. Was each level carefully tweaked to cause you maximum problems? The 2 player option makes things easier, this basically doubles your chances as the level isn’t considered failed until both players are out. Could There Be More To This Game Than A Simple Shooter? Level 100, the last level of Ooops Up. This is the level that leads me to believe that there is more to this game than meets the eye. I think that some icon drops aren’t random and follow a sequence to help or hinder you. Level 100 is basically 3 small areas and one low corridor, you can see it in the image above. Small areas are annoying when the meteors group up. You need to wait for them to separate then pick them off one by one. The standard weapon is ok here but the sticky cord may be the best option. Luckily, the game always makes this available as one of the first pickups. Clear the 1st area (bottom left) and move your way along the corridor being mindful that meteors may fall down the ladder from above. Again, the cord weapon works best here. Once the 2nd area (top right) is clear the only way to get to the 3rd is via a teleport icon. The cord weapon helps here as you can teleport in, deploy and teleport out leaving your cord in place. It is as you clear the 2nd area that it seems that the game knows to drop a shield icon. A shield seems like a good idea but if you collect it you revert back to the default weapon which isn’t much use in the 3rd area. You need to leave the shield until it vanishes before moving on but this eats up your tight time limit. This pattern of icons seems to repeat on each replay. The graphics are best described as simple and functional, don’t expect anything flashy here. This is probably a good thing, there can be a lot to keep track of and distractions wouldn’t help. The backgrounds change with each level. 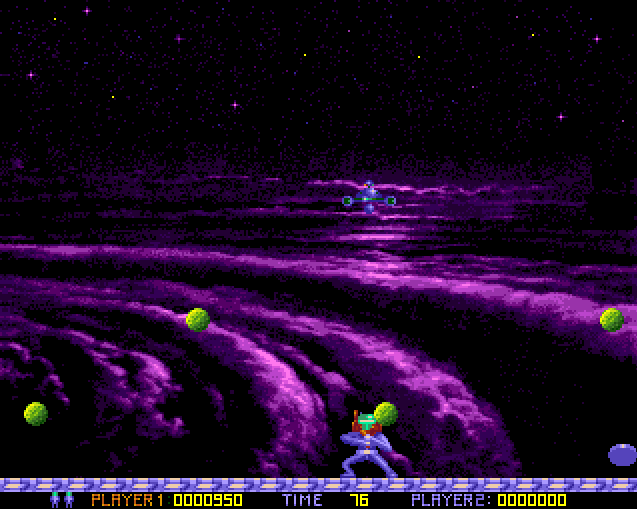 Alien landscapes and space vistas are shown which repeat from time to time with a palette swap. Everything moves smoothly and is well animated. The main character’s permanent action stance and the way he moves makes him seem a little awkward. The main title graphic is very basic and there is a loading screen which shows a kid playing a game which doesn’t seem to relate to anything in the game. Sound wise, it is all or nothing. The main theme plays constantly from the 2nd loading screen and doesn’t stop unless you hit F4. Doing that also mutes the in game sound effects. The tune isn’t an exact copy of the original. Consider it a remix. Sound effects are limited, you’ll discover that space rocks go pop when shot. At first, I didn’t enjoy this game at all. It grows on you though. 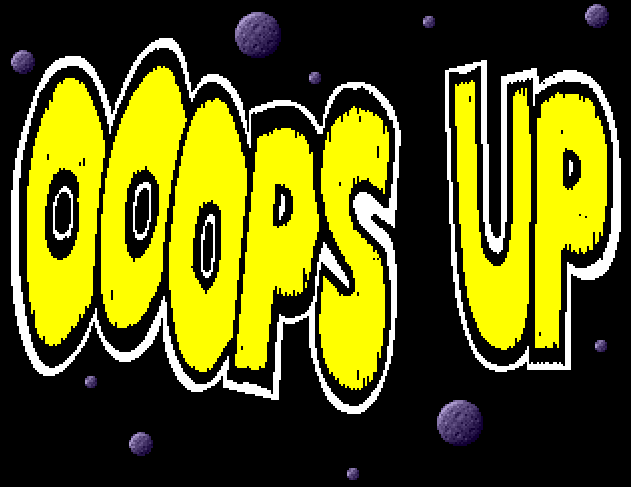 Even though it still annoys the heck out of me I do like Ooops Up. There is a decent challenge here. Unlike The Power the mistakes made are due to lack of skill or luck rather than devious level layout that leads you down a dead end. Playing this with a friend is recommended (John and Aaron, why not give it a go). Worth checking out. Nice find, Duncan! I think we might give it a go! I’m used to getting mashed at hard Amiga games…thank you level codes! At least you can get mashed as a team!